« The digital adaptation of Colt Express is finally here! Digital Christmas sales have already begun! Digital Santa is coming early this year, and bringing massive discounts in his sleigh! Winter is here, and you’re curled up by the fire wondering what could get you through the cold days? Asmodee Digital has the answer! From December 16, 2016 (December 22nd for Steam) to the January 3, 2017, all our digital games are up to 70% off! 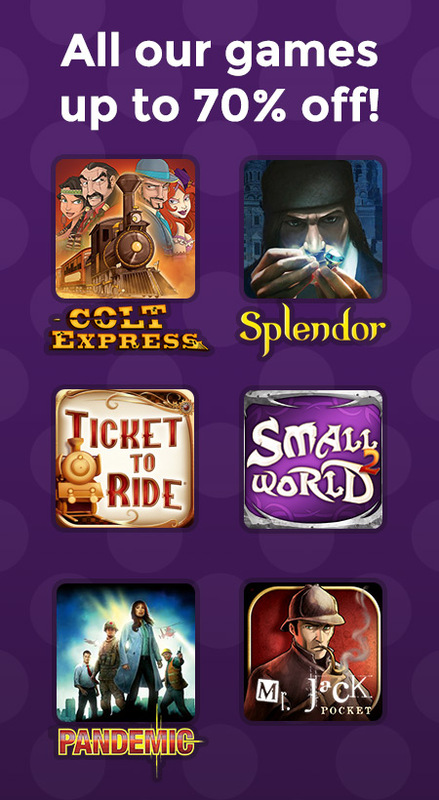 Re-discover all-time classics such as Ticket to Ride, Splendor and Small World, or play the newest additions to our digital board game catalog such as Pandemic, Colt Express and Mr Jack Pocket. This entry was posted on Monday, December 19th, 2016 at 18:13 and is filed under Days of Wonder Online. You can follow any responses to this entry through the RSS 2.0 feed. Both comments and pings are currently closed. Does this include in-app purchases such as Nordic countries and the new Germany-map? If so, when is price reduced, since in-game menu still shows full price? I also would like to know the answer too. Yes. I would also like to know the answer, please. I would also like to know. App seems to be showing full price… any bundle prices? Please help! Would like to add TTR maps to 2nd iPad but all are showing at full price. Is the discount applied at checkout? I would like to add to my maps in the app and don’t see any change in price. The sale is only for the base game of each title. Expansions are not included in the sale at this time. I can’t find the in app purchases for iPhone. I don’t see the expansions unles it already comes with the game included? Is the sale only available for people in America? It seems to be full price in the app store. With the amount of expansions available for the digital versions of the game totaling about $30, I’m not sure that the base game shouldn’t be out right free. I enjoy the game but it feels like a bait and switch being nickel and dimed over every single available map. It would be really nice to have a Game of The Year edition with all the expansions or at least some sort of special bundle or 70% off the expansions for existing members. That is literally the only way I would ever part with my money on a mobile game. Hmm… Small World is full price in Canada. I guess it says UP TO 70%, so they aren’t lying…. 0% is less than 70%. The Ticket to Ride App on the Apple App Store is full price again. I wanted to buy it before it went back to full price in January 3rd, but it’s gone back up a day early. Is this a mistake? All the games on the app store are at full price again, i wanted to pick up pandemic, the prices on the google store/steam are still discounted.